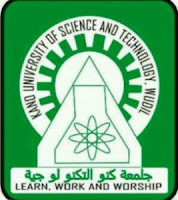 The management of the Kano University Of Science And Technology (KUST), Wudil, has announced the extension of the registration deadline for the 2017/2018 academic session. The Vice-Chancellor has graciously approved the extension of the period of registration from Monday 26th March to Friday 6th April 2018. Late registration starts from Monday 9th to Friday 13th April, 2018. Students are requested to pay registration fees and conclude all aspects of registration within the stipulated period as no complain will be entertained after closing date.